Diary of a Wimpy Kid is on the most checked out aka "the most wanted" list at libraries everywhere. In my public library we gave up trying to shelve the books and just created a table where we kept the few that were available each day. As fast as we put them out on the table, some glazed-eyed kid would pick them up and make off with them and we'd have to find read-alikes to cover until another Wimpy Kid strayed back to us. So, we have a generation of kids who relate to being Wimpy...or at least love to read about someone wimpy who perhaps makes them feel they aren't that bad after all... at least compared to this guy. But, for fifth-grader Marc, the wimpy world is not a place you'd want to be. As the school year comes to a close, the dreaded Sports Day shows up and Marc is subjected to one humiliation after another as he struggles with the three-legged race, the bobbing for apples and then the real fiasco, his turn at the pull-up bar. Marc is last seen running from the field to a place where he can be alone to cry his heart out. He can't swim. He doesn't know his times tables. He can't do a single pull up and Kenny Williamson the school bully picks on him relentlessly. This wimpy kid stuff just isn't that funny when it's you. But, Marc's life is about to change. His Uncle Jake, a Navy Seal, is coming to stay with them for the summer. Jake steps off the airplane, meets Marc and his mother in the terminal, reaches to shake Marc's hand and says, "Is that all ya got?" When they get home, Marc and Jake are sharing a bedroom and as Jake settles in, Marc ends up breaking down and telling his uncle the whole ugly story. What happens next is the story most kids need to read when they are about ten, eleven or twelve years old. This is where the helicopter parent stops and the inner warrior seed is planted. You can do it. This is how you get there. 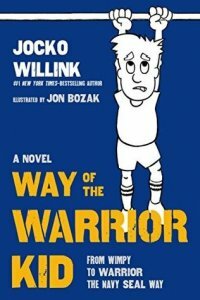 Jake has a notebook filled with the Way of the Warrior. There's a page for the Seal Code, Viking Laws, The Ranger Creed, The United States Marine Corps Values, The United States Army Warrior Ethos, the Samurai Code, ....you get the idea. These are the big guns..the men and women who have adopted a code that guides their lives and creates heroes. Anybody ready to sign up? Marc is in. He is going to find out it isn't easy. Being a Warrior doesn't just get handed to you. You have to make it happen. Jake is the perfect teacher. He knows how to challenge Marc and he is able to explain the code as they go along so Marc learns the stages. At first Jake is waking Marc up in the mornings and he is responsible for the sense of discipline. When they hit a plateau, Jake knows how to overcome the obstacle. But gradually, Jake lets go as Marc starts to build his own muscle..physically and mentally. This is a rock solid guide of many of the ethics and standards previous generations grew up learning year by year. Where we lost the idea of teaching children to apply themselves, to be determined, to persevere, to tell themselves to do what's right, and to recognize their ownership of their success, I do not know. I was sitting in the dentist's chair a week ago listening to the dentist and the hygienist moan about their children's lack of a work ethic. Over my open mouth, filled with tubes and cotton, they discussed how their kids don't do anything around the house...have no chores. Sigh. If we don't ask this of our children, will they ever to learn how important it is? This book is a manual for parenting and for teaching children how to succeed in life. It's the Navy Seal way and the Marine Corps way and the Army way and the way of the Samurai. It's all about responsibility and hard work and identifying a problem and carrying through on the solution. Following Marc as he challenges his physical weakness, his love of junk food, his lack of self-discipline, his fear of water, we learn right along with him and probably recognize some of our own less than warrior-like tendencies. This could be mandatory reading in every home and every school. It makes it clear no one is going to do it for you. You have to do it for yourself and here's how. 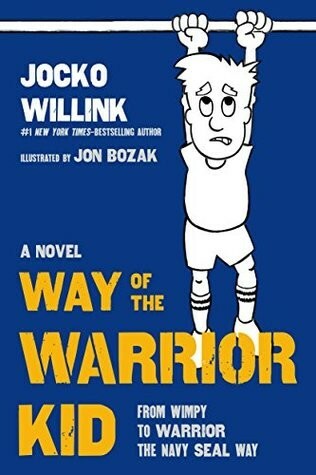 Pair this with The Playbook by Kwame Alexander and you have the bald facts and the reassuring inspiration that you can be a warrior... and not all warriors are on the battlefield.